Hyundai-Sime Darby Motors (HSDM) is putting on a big show at the KL International Motor Show (KLIMS) 2018. On the brand’s stand, there are new models for Malaysia (Santa Fe, Grand Starex facelift), cars that showcase the company’s eco-friendly tech prowess (Nexo FCEV, Kona Electric), interest gauging models (Accent) and even an N corner with the i30 N hot hatch. In this post, we’ll focus on the Kona. The South Korean carmaker’s compact SUV for millennials first surfaced in June last year. Sitting below the Santa Fe and Tucson SUVs, the Kona sports bold design befitting its positioning. The face, which reminds us of the Citroen C4 Cactus, has slit-like LED daytime running lights sitting separately above the LED main beams, which flank the corporate Cascading Grille. Fog lamps on a narrow lower intake make it three tiers of grilles and lights. The rear adopts the same tiered layout for the lamps. Hyundai says that visual relationship between the “composite lamps”, the Cascading Grille and the unique “body armour” results in a distinct character, and we don’t disagree. Note the integration of the wheel arch part of the black armour with the lower lamp surrounds, front and rear. There’s also a black “floating roof”. The Kona is 4,165 mm long and 1,800 mm wide; which makes it 129 mm shorter than a Honda HR-V, but 28 mm wider. Its roof is also 55 lower to the ground than the Honda, which gives the Korean a good stance. The wheelbase is 2,600 mm, which is just 10 mm short of the Honda, the sales and space champ of the class. The Kona is available with a couple of engines globally, and among them are a 2.0 litre MPI, 1.0 litre T-GDI three-cylinder and a 1.6 litre Gamma T-GDI. 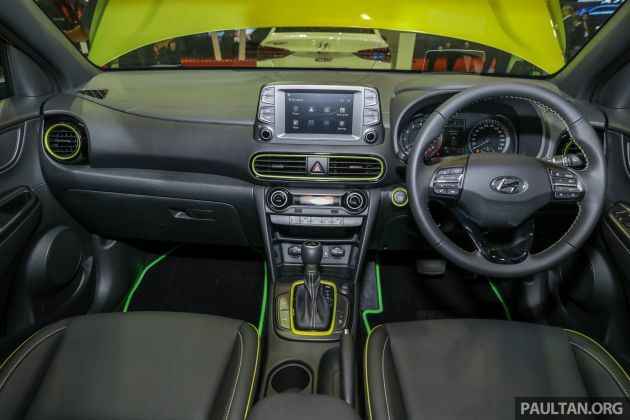 The latter – with 177 PS, 265 Nm of torque, a seven-speed dual-clutch automatic gearbox – is displayed here in lime green. It does 0-100 km/h in 7.9 seconds and a top speed of 205 km/h. Available equipment include a head-up display (HUD) with navigation, a premium sound system by Krell, wireless charging and Hyundai’s full suite of active safety and driver assist systems, as seen in our Ioniq Hybrid. Nice interior accents colour coded with the chosen exterior shade, too. The battery-powered Kona Electric was released in February this year in production form. One of the most impressive mass market EVs on sale today, it packs a 64 kWh battery and is good for a claimed driving range of up to 482 km. Maximum output is 204 PS/395 Nm, pushing the EV from 0-100 km/h in a swift 7.6 seconds. There’s also a basic version with a 39.2 kWh battery, good for 300 km and 135 PS. 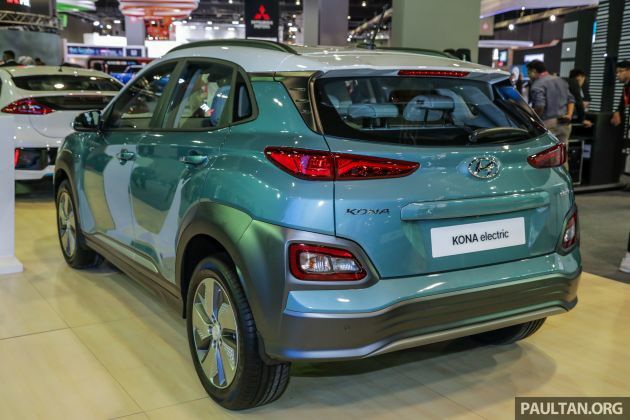 The Kona Electric is on sale elsewhere, but its maiden appearance in Malaysia is purely as a technological showcase, along with the company’s ultimate tech flagship – the Nexo fuel cell EV. 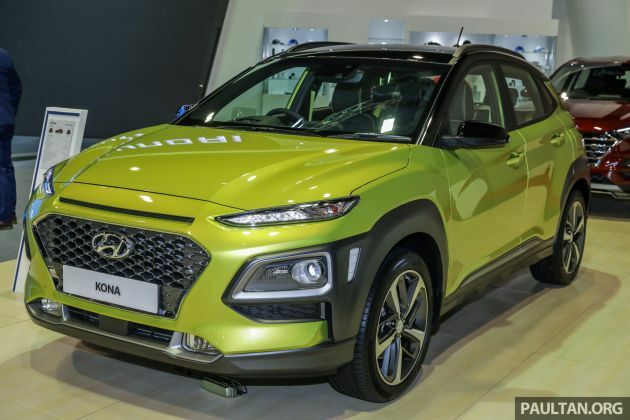 As for the internal combustion engined Kona, HSDM does have plans to bring it in, and the target window is Q2 2019. However, the choice of powertrain – 2.0 NA, 1.6T or even both – is yet to be determined. This one against the Honda HR-V, Toyota C-HR and Mazda CX-3 – what do you think? exterior & interior, the Geely Binyue aka Proton X50 1.5TGDI better. X50 1.5 qualifies for petrol subsidy while Kona 1.6 does not. Sure gone case if come here.